Penny-wise, pound-foolish’ is a popular English saying. It means, according to the Cambridge Dictionary, “to be extremely careful about small amounts of money and not careful about larger amounts”. Embattled Indian business tycoon Vijay Mallya, who has taken shelter in the United Kingdom to escape Indian authorities, may now literally be counting his pennies and pounds. 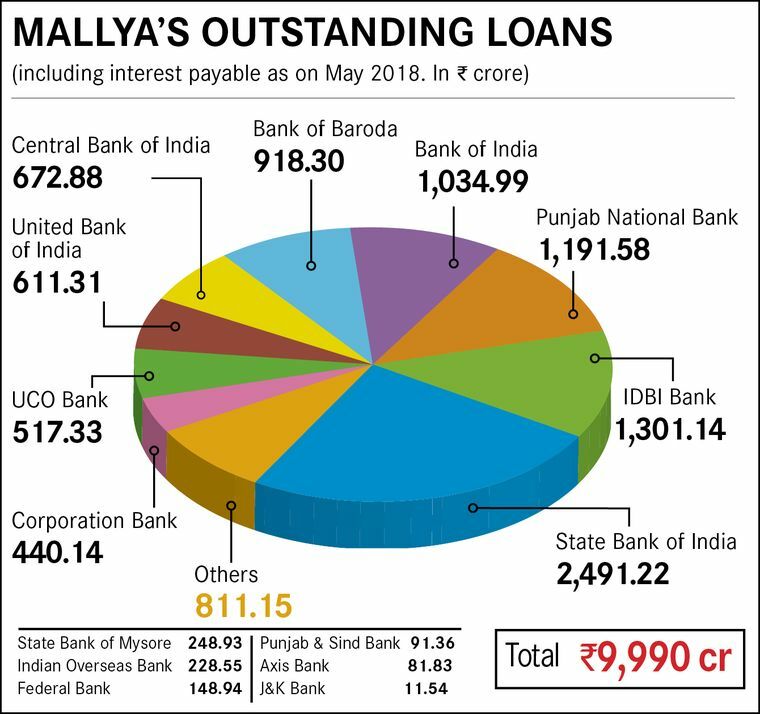 Mallya owes about Rs 9,990 crore to different banks. As India has begun its most sincere effort to bring him back to face the law, he is exploring ways to save some pennies and settle his dues so that the government does not proceed with the criminal charges levelled against him. The Enforcement Directorate and the Central Bureau of Investigation have filed charge-sheets accusing him of “criminal conspiracy, money laundering, cheating and dishonest conduct,” besides financial irregularities in non-payment of loans to public sector banks. It is under these provisions of the new law that the ED plans to confiscate Mallya’s assets. While he owes Rs 9,990 crore to a consortium of banks, a detailed evaluation of his movable and immovable assets by the ED shows that they are worth around Rs 12,500 crore. “This means that there will still be an excess of nearly Rs 3,000 crore that will be confiscated by the government if he does not return,” said an ED official. This amount will go to the exchequer. If Mallya returns, he will get a chance to save himself and his treasure trove from punitive action by contesting the claims before a court of law. This, however, will not guarantee him an escape from jail. Mallya, who inherited a substantial fortune from his father, once figured in the Forbes list of the world’s richest. He ran a liquor business that made a lot of money, an airline company that burnt a lot of money and a few sports franchises. 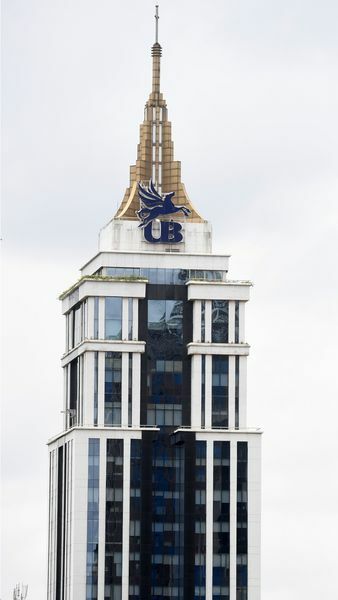 The ED has identified several immovable and movable properties of Mallya, his United Breweries (UBHL) and a few other entities that he controls. “The funds obtained by [Mallya’s] Kingfisher Airlines are nothing but the proceeds generated out of criminal activity related to the scheduled offence under the Prevention of Money Laundering Act, and utilised projecting as untainted money. Hence, these are proceeds of crime (PoC) and the same are involved in money laundering,” said an ED official. The ED attached Mallya’s properties worth Rs 1,400 crore in June 2016. It is now looking to confiscate properties worth Rs 4,234.84 crore—a farm house in Mandwa, Alibaug (Rs 25 crore), flats in Kingfisher Tower, Bengaluru (Rs 565 Crore), fixed deposits in HDFC (Rs 10 crore), shares of United Spirits, United Breweries and McDowell Holdings held by Mallya and the entities he controls (Rs 3,635 crore). In Mumbai, the ED has attached properties of Mallya and his companies with a market value of more than Rs 8,000 crore, said an ED official. On another application of the ED, the court ordered attachment of shares worth around Rs 1,620 crore. All the attached properties will be confiscated by the ED if Mallya is declared as a fugitive under the new law. In an affidavit filed before the Karnataka High Court on June 22, 2018, Mallya offered to sell assets worth Rs 13,900 crore under “judicial supervision” to repay his creditors. These include fixed assets worth Rs 1,699.45 crore and pledged and unpledged shares worth Rs 4,978.19 crore (both attached by ED), fixed deposits and bank balances worth Rs 198.08 crore (recovered by Debts Recovery Tribunal), sale proceeds of Kingfisher Villa (Rs 73 crore), an amount of Rs 1,473.99 crore (held by Karnataka High Court), and an additional amount Rs 2,649.45 crore to be raised from the sale of other assets. 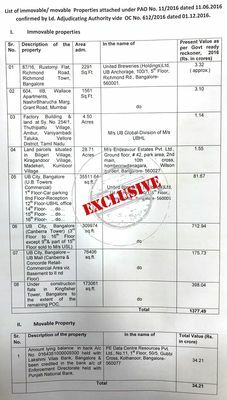 Earlier, in March, too, UBHL told the Karnataka High Court that the company held assets and shares worth Rs 12,400 crore, and it could easily clear the dues which were less than Rs 10,000 crore. Mallya says that he has been falsely made the “poster boy of bank default and a lightning rod of public anger”. “There is nothing I can do if politically motivated extraneous factors interfere with my efforts to settle the dues,” he tweeted once. 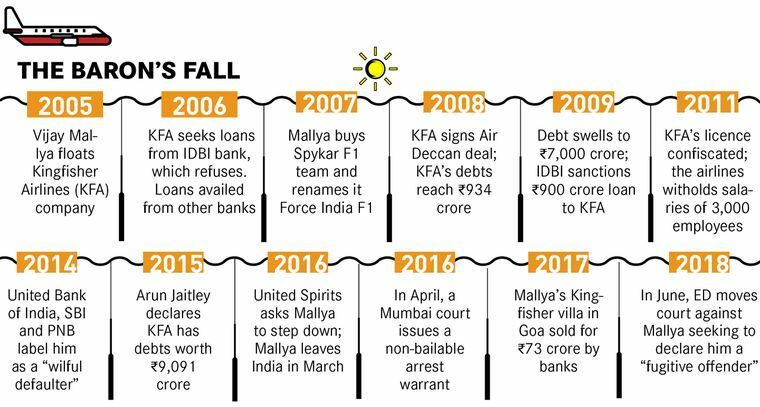 In an election year, when the common man will be taking stock of the government’s promises on cracking down on black money and bringing back economic fugitives, Mallya may become a test case. A special Prevention of Money Laundering Act court has summoned him to appear before it on August 27. If he does not, action can be initiated under the new law. Mallya’s will be the first case under the law and the Narendra Modi government seems keen on a good start. A few days before Mallya’s appearance in a British court, which heard his extradition case on July 31, there was speculation that the he had struck a deal with the Indian government. Neither the government nor Mallya has confirmed this. But, behind the scenes, both sides are weighing the options. For now, Mallya’s counsel in the UK seems to have managed to put the ball in India’s court by bringing up the poor condition of prisons in the country to contend against his extradition. Mallya, who has been on bail since his arrest in April 2017, has complained that the cells in the Arthur Road jail in Mumbai, where he is expected to be kept when he returns to face trial, do not get natural light and fresh air. Judge Emma Arbuthnot has asked for a video footage of the prison to examine the conditions, and she adjourned the case till September 12. At this juncture, the government may need to tread carefully, given its experience in the past. In 2011, India was desperate to extradite fugitive Mohammad Hanif Umerji Patel, alias Tiger Hanif, the alleged mastermind of the 1993 Surat bomb blast. India agreed to allow a human rights expert from the UK to visit Gujarat and examine the conditions of the prison where Hanif would be lodged after extradition. Professor Derrick Pounder, the expert, came to India in December 2011 along with the defence counsel, and visited the Sabarmati Jail and the Vadodara Central Jail. But they returned unsatisfied because they could not meet the co-accused in the jail without the jail officials’ presence. Hanif was not extradited. The setback came close on the heels of Denmark refusing to extradite Kim Davy, the prime accused in the Purulia arms drop case, on the grounds of “risk of torture or other inhuman treatment”.